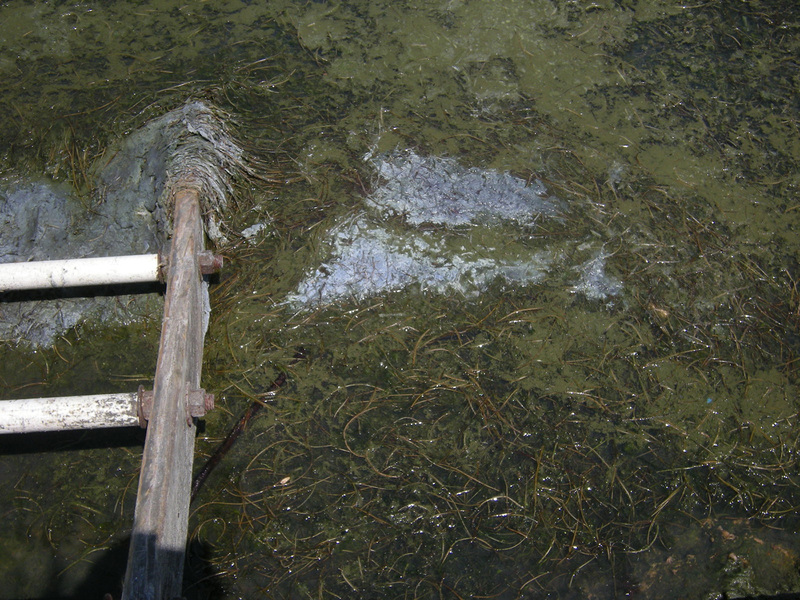 Disgusting and even toxic algae run amok when a lake contains too much phosphorus. Now we hear that low phosphorus levels lead to high nitrogen levels. What’s an environmentalist to do? Two elements have taken center stage in the fight against surface water pollution: nitrogen and phosphorus. Both are essential plant fertilizers, and both can cause serious water pollution. Overloads of nitrogen can wash downstream to feed algae that monopolize oxygen when they decay, creating fish-fatal “dead zones ” near the mouth of the Mississippi and hundreds of other rivers. Overloads of phosphorus in lakes can cause overgrowth of choking weeds and contributes to disgusting “blooms” of toxic cyanobacteria. In general, levels of both nutrients have been rising in surface waters for decades. Fertilizer and other initiatives related to infrastructure, policy, microfinance, education, and advances in markets — have led to major gains in farm productivity. 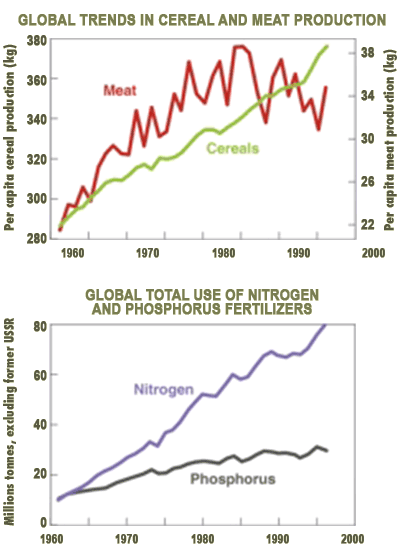 But increased use of phosphorus and nitrogen is polluting surface waters in agricultural regions. After years of focusing on nitrogen, regulators turned their attention to phosphorus. Ever-tightening restrictions on releases from sewage-treatment plants, combined with controls on erosion and development, and smarter use of fertilizer, have started a trend toward lower phosphorus levels in U.S. waters. In Science today, however, we read that reducing phosphorus may, ironically, impair removal of nitrogen. After looking at pollution levels in large lakes – including four Great Lakes, Jacque Finlay, of the University of Minnesota, and colleagues found when phosphorus fell, the level of nitrogen rose in 10 of the 12 lakes studied. Although correlation does not prove causation, Finlay says a mechanism can explain the link: When phosphorus accelerates plant growth, those plants also remove nitrogen from the water. When they die, the plants carry nitrogen to the lake bottom, where it can enter long-term storage. Nitrogen pollution: An unintended consequence of controlling phosphorus! Finlay notes that the same high-nitrogen, low-phosphorus relationship appears in the St. Lawrence River, which drains the Great Lakes. But it may not prevail in smaller lakes and rivers, which are frequently flushed by new water. 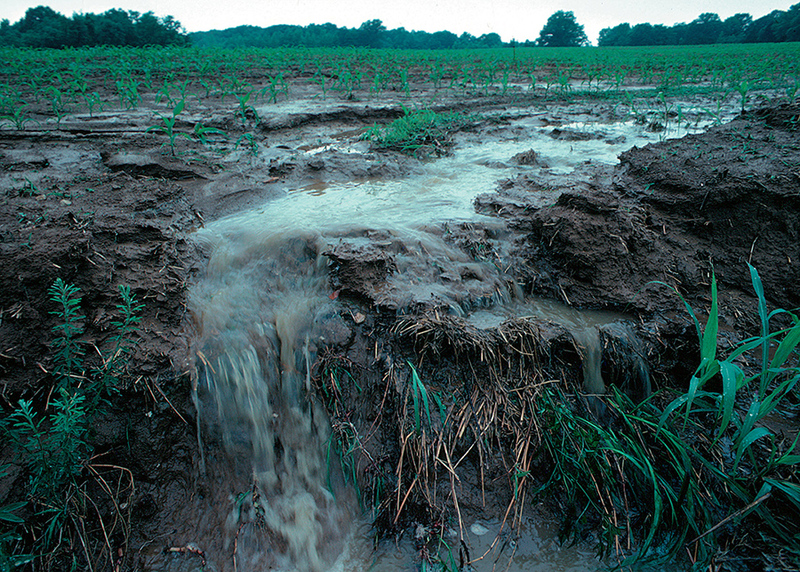 As rain falls on a bare farm field in Iowa, runoff carries topsoil, fertilizer and other pollutants into streams, rivers and lakes. Like the effort to control acid rain that began killing forests in the 1980s, the unwelcome phosphorus-nitrogen relationship follows the law of unintended consequences. Acid-rain regulations helped save forests dying in a bath of acid, but the sulfur oxides were, ironically, reflecting solar heat back to space. And so a pollutant that was killing forests was also retarding a planetary warming that is also harming forests.